So for the longest time now, Duc's been asking me to make him my own rendition of bread pudding. I'm not sure what started that itch but at some point, he stopped asking because he realized I wasn't going to. THEN, we were talking about making wings with the Jamaican jerk seasoning I had for a Superbowl get-together with some friends, and I brought up that I also wanted to bring dessert. I thought of Jamaica and figured rum should be a part of my dessert. After more brainstorming, rum raisin bread pudding sounded like a fun idea to try so here we go! 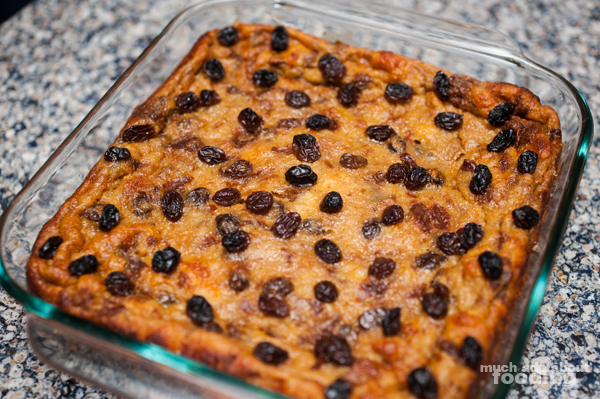 Note: this is a sauce-less bread pudding - the gooeyness will be inside instead of outside this dessert. 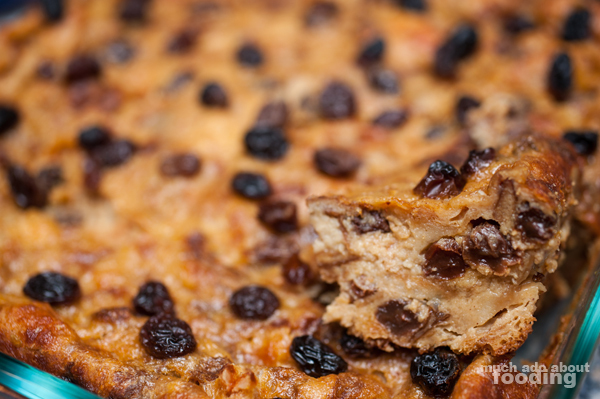 In a large saucepan, combine milk, butter, vanilla extract, cinnamon, rum, sugar, and raisins. I started with the sugar and butter first to make sure it was well melted before adding in something cold like milk which will slow down the heating process. Cook on low and stir frequently to prevent burning. Simmer until sugar has all dissolved. While waiting for that to happen, tear apart bread into a large mixing bowl; you'll want the pieces to be small - think of how much you'd get off by roughly pinching. Take the liquid off the heat and pour over bread, folding in to cover all pieces. Let sit for approximately 30 minutes so everything soaks up. At this time, in a separate bowl, beat together the eggs until thoroughly mixed. Pre-heat oven to 325°F and grease an 8"x8" pan (or other baking dish that can hold 2 quarts). Once bread has soaked up all the liquid, mix in beaten eggs. Then pour into baking dish and place in oven for 45-50 minutes. Check doneness by inserting toothpick down center and seeing if it comes out clean. Remove from oven and let cool slight before serving (but remember that it tastes best a little warm). I suggest finding some rum raisin ice cream to pair with it!